I was just 22 when I started my journalism career with Eastern Group Publications and I feel fortunate that EGP gave me the opportunity to become a voice for the community at such a young age. 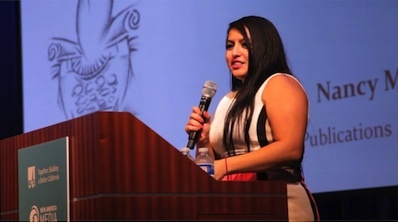 Former EGP reporter Nancy Martinez, (pictured) was recognized by New America Media for Outstanding Coverage of the Environment. Over the next several years I would report on a myriad of stories and issues, from city budgets to teacher cuts, innovative school programs, elections and recalls, community and park cleanups, developments in the Montebello Hills, good government reforms in Vernon and the slaying of an often controversial Bell Gardens mayor by his wife. There were stories about crime, the friendly game of loteria at the Bell Gardens Senior Center, a heavy metal mariachi band, and the anger of residents in East Los Angeles who feared another transportation project would tear apart their community. But it was reporting on the now-shuttered Exide plant in Vernon that had contaminated nearby communities with toxic chemicals that truly made a difference in how I viewed community news. EGP had already been reporting on this issue for years before I arrived on the scene. It had already established itself as a voice for the voiceless, highlighting an environmental disaster that had yet to be recognized by state officials. My coverage of the ongoing issues caused by the acid-lead battery recycling plant is what I am most proud of. The article that has meant the most to me, and made the biggest impact on my career, is one that compared the disparities in the state’s response to the Exide contamination in the mostly blue-collared communities on the eastside and its response to the Aliso Canyon gas leak in the more affluent Porter Ranch. The article served as a powerful juxtaposition of the two catastrophes, catching the attention of the area’s elected officials who had for the most part done little to respond to the Exide disaster, instead telling residents they didn’t have the power or the governor would not talk to them. Faced with the reality of the terrible double standard when it came to protecting working class Latinos, their constituents, they were at long last compelled to do something to respond to the growing anger over the disparity painfully detailed in black and white. Eventually, the major media outlets did pick up the story, never crediting EGP, which had been reporting on the issue for more than a decade. But the community knew EGP was there from the beginning, long before the cameras showed up. After four years of reporting on Exide, I had become somewhat of an expert on the issue, which allowed me to create this narrative. 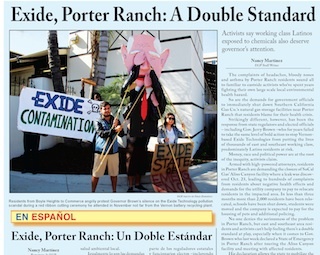 I was at first hesitant to call myself an Exide expert, but my editor, Gloria Alvarez, repeatedly reminded me that my years of coverage had given me a unique perspective and insight into the issue. Unlike major media outlets, I had spoken to countless residents over the years, attended dozens of community meetings and public hearings, and reported the stories that could only be told by someone who was truly in touch with the community. I am thankful that my editor encouraged me to ask the critical questions that elevated my reporting. It was this encouragement that led me to ask camera-ready local, state and congressional elected officials— gathered at Resurrection Church in Boyle Heights to celebrate the state’s long overdue clean up plan with the community — why they had not come together sooner like they had that day to demand action on behalf of their constituents. The unsatisfactory response: someone else had dropped the ball. By the time I turned 26, I had interviewed a long list of powerful elected officials who were forced to answer for Exide. I was invited to provide commentary on radio stations, based on my reporting, and served as a panelist alongside one of those officials in question to discuss air quality issues. I know EGP’s coverage of Exide made a difference in the ongoing battle of this environmental injustice. I realized this when a local activist group recognized me for serving as a voice for the community. A statewide coalition of ethnic media outlets soon followed with their own recognition, awarding EGP first place for outstanding coverage of the environment for our coverage of the Exide environmental disaster. EGP has always been a voice for east, northeast and southeast Los Angeles County communities. I’m proud to have had my name on the pages of its newspapers. Nancy Martinez is an Interactive Communications Officer with the City of Torrance, where she is charged with sending time-sensitive information to the public. She reported for EGP between 2012-2017. Her extensive coverage on Exide garnered her community recognition and an award for outstanding coverage of the environment by New America Media.